Mathias Lin est un descendant par le nom de Lin Fuchen, né Paul Splingaerd. Il est donc un de nos cousins lointains. Il se rattache à la famille de ses descendants par voie adoptive; il n'est pas rattaché génétiquement au mandarin mais uniquement par tradition, comme son père. Mathias Lin nous a quitté il y a peu de temps. Malgré le peu de précisions issues des membres actuels de sa famille, il semble qu'il ait été un personnage extrêmement intéressant, digne d'être incorporé en première ligne parmi les descendants du belge Paul Splingaerd. Maîtrisant sans doute le chinois mandarin et le chinois cantonnais, il maîtrisait probablement le français et l'anglais ainsi que l'italien. Il était donc dans la lignée de Paul Splingaerd, polyglote. Mathias Lin is a descendant of Lin Fuchen, born Paul Splingaerd. It is one of our distant cousins. It belongs to the family of his descendants by natural or adoptive track. We have no details. Mathias Lin left us there shortly. Despite the lack of details from the current members of his family, he seems to have been an extremely interesting character, worthy of being incorporated in the front line among the descendants of Belgian Paul Splingaerd. Probably beating Chinese Mandarin and Cantonese Chinese, probably he mastered French and English and Italian. It was thus in the tradition of his grandfather Paul Splingaerd, multilingual. Nous avons eu la chance qu'une personne accepte de nous traduire ce texte; le voici et meilleurs remerciements à Alice Yuan-Megowan. Dr. Mathias Lin (1922-2007) was born on February 18, 1922 in Hebei Sheng (河北省)Tianjin City (天津市). The grandfather of Dr. Lin was Belgian aristocrat (surname Splingaerd), who was a Belgian ambassador to China (Dr. Lin’s mother and grandmother are both Chinese). 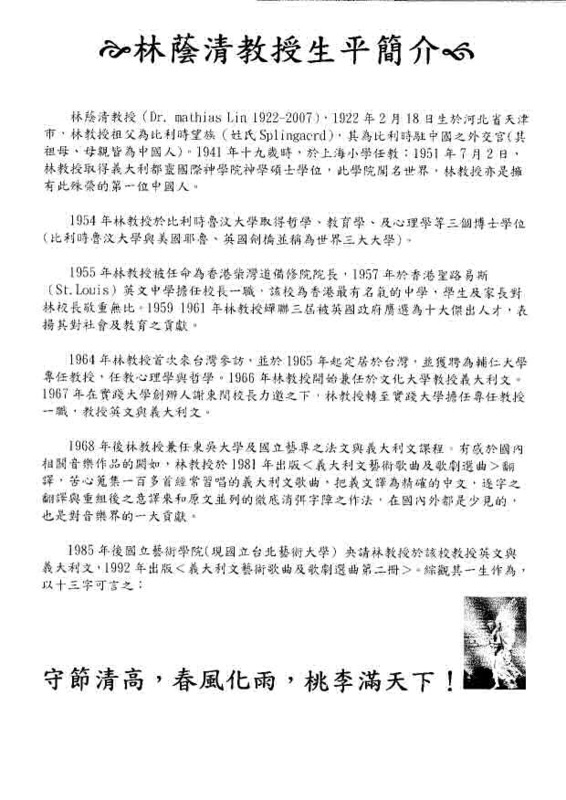 In 1941, when Dr. Lin was 19 year old, he taught at Shanghai Elementary School. In July of 1951, Dr. Lin received his Master’s degree in Christian Theology at Italy’s International University di Lecce. This university is well known throughout the world, and Dr. Lin was the first Chinese to receive that degree there. In 1954, Dr. Lin received his PhD in Educational Psychology at Katholieke Universiteit Leuven, (KUL) which is Belgium’s equivalent of Yale in America and Cambridge University in England. In 1955, Dr. Lin was appointed as the head of Chai Wan (St. John the Baptist) Church, and served as principal of St. Louis English School in Hong Kong, one of the city’s best high schools. Students, faculty, and parents all respected Dr. Lin. Dr. Lin was also recognized by the British government as being one of the top 10 achievers of the year from 1959 to 1961. Dr. Lin first visited Taiwan at 1964, and relocated there in 1965, when he was hired by Fu Jen Catholic University to teach Philosophy and Psychology. He was later hired by the Chinese Culture University as professor of Italian, and then he was asked by the Hsieh Tung-min, the president of Taiwan Shih Chien University to teach English and Italian. Dr. Lin also taught French and Italian at Soochow University and National Taiwan University of Arts. Recognizing the limited access to foreign music in Taiwan, he collected over a hundred Italian songs, translated them then published Italian art songs and opera selections. His translations were detailed and clear, and eliminated the language barrier, which was very rarely seen in his time. This was a huge contribution to local musicians. In 1985, Taipei National University of the Arts asked Dr. Lin to teach English and Italian, he also publish the second volume of selected Italian songs and operas. Dr. Lin’s life can be summarized with these words: it was a life fulfilled with dignity, under the salutary influence of education, with admiring pupils everywhere. Ajoutons que Anne Splingaerd-Megowan a obtenu un contact avec un ancien élève qui a connu le Dr Lin à Taiwan: Monsieur Elias S. W. Shiu qui nous a procuré des photographies fort intéressantes du temps où il était religieux. Let us add that Anne-Splingaerd Megowan got a contact with a former student who has known Dr. Lin in Taiwan: Mr. Elias S. W. Shiu who gave us some very interesting photographs from the time he was religious.